Heureka is the biggest science centre and here you get to take part in various exhibitions and activities. Activities include experiments where visitors can try things within engineering and science. There’s also a planetarium showing excellent planetarium films. A visit to the science centre is suitable for all ages and there are even things for the little ones to keep busy with. If you visit Heureka during the summer, there’s also a fantastic outdoor part with various exhibitions. Outside Helsinki is one of the world's largest lake fortresses, named Suomenlinna, on six different islands. Suomenlinna is also called the Gibraltar of the North and is a great place to explore for visiting tourists. It’s worth knowing that this sea fortress is actually on the World Heritage List and that it was built in the 1700s when Finland was part of Sweden, making Suomenlinna Sweden's most expensive defensive project ever. Tourists can visit Suomenlinna all year round and there are museums, shops, cafes and restaurants on the island. To leave this admirable sea fortress there are ferries that depart from central Helsinki. Those who choose to go to Suomenlinna shouldn’t miss visiting the toy museum that’s located here. At Suomenlinna Toy Museum, you can admire a large collection of toys from different time periods. Amongst other things, you’ll find dolls, action figures and toy cars—all of which at one time or another had a place on every child’s wish list. The collection can be even more nostalgic for those who grew up before the time of computers and video games. The museum is also a cafe, overlooking the sea, serving Russian-style tea and various pastries. The Market Square in the centre of Helsinki is for those who like traditional street markets. Market Square is the city's largest market and is frequently visited by tourists. Here you can find everything from traditional food to clothing and souvenirs. If you visit Helsinki in the first week of October, you might just get the chance to go to a traditional herring market that dates from the 1700s when it was organised at the Market Square. Most people probably associate Finland with cold and snow, but Finland actually maintains rather high average temperatures during the summer months and when a heat wave comes along it can reach upwards to 30°C. If you visit Helsinki in the summer, there are plenty of great opportunities to swim and sunbathe. 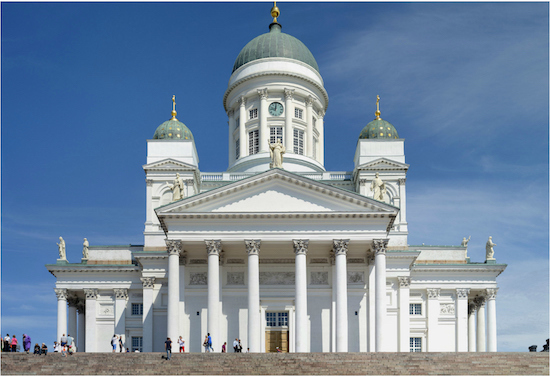 There are over three hundred islands and the coastline is almost a hundred kilometres long – just in Helsinki alone! The most popular beach in Helsinki is Hietaniemi Beach, which has pretty much everything you need for a relaxing day on the beach. Hietaniemi Beach is well worth a visit even during the winter, but a stroll in the beautiful winter landscape might be more fitting than swimming and sunbathing. Most European cities have an old part of town where the old architecture has been preserved for centuries. This is also the case in Helsinki, but what’s unique about the Helsinki Old Town is that it has a blend of new buildings and therefore a newer modern architecture. There’s more new architecture than old in the Old Town of Helsinki, but you can see an amazing contrast between modern and historical architecture at the same time. In the Old Town you'll also find shops, restaurants and cafes. Helsinki Central Station is one of the oldest and best preserved major railway stations in the world. The building is made out of Finnish granite and it is characterised by its bell tower and the four statues that guard the main entrance. The station opened in 1919 and took a long time to design and plan. The railway station is today considered one of the most admirable buildings in Finnish architecture. Finland is known for its design and designer brands, such as Marimekko and Ittala that are largely popular across the world. If you want to see more Finnish design and maybe buy something to take home with you, you should visit the area of Helsinki called the Design District. This area lies between Esplanadi and Punavuori and consists of twenty-five streets in total. Here you’ll find tons of shops and malls with jewellery, clothing and more from various Finnish designers. The shops are often innovatively designed and even if you don’t plan to buy anything, it can be an experience in itself just to go in and take a look. In 2011, the 30,700-square-foot Music Hall in Helsinki was built. It consists of several small auditoriums and a larger stage. Here you can listen to amazing concerts of classical music as well as concerts of music from many other genres. There’s also a shop, a music library, a restaurant and several exhibitions. Current programs of which concerts and performers will be performing can be found on the Music Hall’s website. The Kotiharjun Sauna is a traditional Finnish sauna that has long existed in Helsinki. This wood-fired sauna has been around since 1928 and has long been visited by Helsinki residents as well as tourists. You can come to take it easy and spend a few hours with the sauna in the Finnish way. For those who wish to, there’s also the opportunity to have a massage or a body scrub. Kotiharjun Sauna is walking distance from the Sörnäinen metro station. Right in the heart of Helsinki you’ll find Linnanmäki Amusement Park. Here you can enjoy yourself by riding one of the park's attractions, along with all the Helsinki residents. In total there are over forty different rides, which is more than any other amusement park in the Nordic region. Hours vary depending on the weather, but the park is usually open every day during the spring and summer. Admission is free, but to ride the attractions you need to purchase either tickets or a pass. Helsingborg is a great bicycling city with great opportunities for those who choose to get up on the saddle. There are several bicycle routes around the city to get around and see the city's different neighbourhoods. Additionally, you can bicycle out of the city along the coast to discover the beautiful coastal landscape. If you’d like to, you’re also welcome to bring your bicycle on the various ferries to ride around on different islands. Bicycles can be rented at several places. The tourist office offers bicycles and various information for the areas around Helsinki. The conservatory in Helsinki is for those who are tired of winter and want to get a taste of the spring greenery. It’s green all year round in the winter garden and as a visitor you can wander around among the exotic flowers and plants. Moreover, there’s a small pond with fish in it. The place has been around for over a hundred years and has long been a spot for recreation and socializing for the townspeople. During the summer, the garden expands to include a section outdoors with a large rose garden. Some probably know or have heard of the tales about Moomins by Tove Jansson. These tales are very popular in Scandinavia and most children have either read the books or seen some of the cartoons about the Moomins. At the Kämp Gallery you’ll find the Moomin Shop, which is a small shop with various things from Tove Jansson's tales. Buy your own Moomin doll, or how about a mobile case with one of fairytale characters? In central Helsinki, the large building Tennispalatsi (The Tennis Palace) can be found. The building was designed by the architecture student Helge Lundström and was built for the Summer Olympics in 1940. The name of the building was originally Autopalatsi (The Car Palace), and the idea was that the building would mainly be used for the repair and service of cars during the Olympics. Unfortunately, the Winter War broke out in 1939 and there was no summer Olympics in 1940. Before the war started, the Autopalatsi had actually been expanded with an additional floor, on which four tennis courts were built (Autopalatsi became the Tennispalatsi after this). Over the years, the tennis courts were used extensively by the Helsinki tennis clubs and when the Olympics came to town in 1952, basketball games were played in the Tennispalatsi. Tennispalatsi has now been redesigned and renovated, and the tennis courts have been replaced by shops, Helsinki City Art Museum and the large multiplex cinema of Finnkino. The Finnkino multiplex cinema offers a total of fourteen movie theatres in various sizes for those who want to sit down and relax with a good film. The smallest one has ninety-two seats and the largest one has seven hundred seats and a big screen which is 184.8 metres across. Regardless of your taste in films, whoever chooses to visit the Finnkino multiplex cinema will most likely find a film to watch. If you want to wander around in the open and you’re interested in taking in the cultural heritage, you should visit one of Finland's largest outdoor museums—Seurasaari outdoor museum. Here you can take a pleasant walk amongst the beautiful old buildings from different parts of Finland. There’s also wildlife here, and if you’re lucky you can encounter courageous birds or squirrels that are ready to be fed directly from the hand. The buildings that visitors can view are not only accessible from both in and outside; this outdoor museum also offers the opportunity of seeing demonstrations of traditional Finnish crafts such as weaving and more. On the eastern side of the island you can get a nice view over Helsinki and if you become hungry during your stay there’s a restaurant that serves several dishes. A very popular museum that often ranks high among visitors and tourists in Helsinki is the Mannerheim Museum. This museum tells the story of military officer and politician Carl Gustaf Emil (C.G.E) Mannerheim, who had a prominent role in the Finnish Winter War and the Continuation War. In fact, the museum is located in the house that Mannerheim lived in between 1924-1951 and the entire interior is well preserved. You will also find several of Mannerheim's belongings, such as medals (he had most of them), books, his different weapons and much more. There’s a lot to learn about this amazing man's life story and the museum tells most of what is worth knowing. If you want to increase your knowledge about European history then this museum is something that shouldn’t to be missed.